We’d love your help. Let us know what’s wrong with this preview of The Healer's Legacy by Sharon Skinner. To ask other readers questions about The Healer's Legacy, please sign up. This review has been hidden because it contains spoilers. To view it, click here. Don't you just love it when a new author hits all your reader happy buttons? I'd never heard of Sharon Skinner until I met her at the L.A. Times Festival of Books. I fell in love with the cover, read a page as Ms. Skinner gave me a brief synopsis and BOOM, I was sold. And she signed my copy, which was so cool. Authors are like rock stars, especially ones I love. The Healer's Legacy is that kind of epic, heroic fantasy that keeps me reading instead of sleeping. It features an intrepid heroine name Don't you just love it when a new author hits all your reader happy buttons? I'd never heard of Sharon Skinner until I met her at the L.A. Times Festival of Books. I fell in love with the cover, read a page as Ms. Skinner gave me a brief synopsis and BOOM, I was sold. And she signed my copy, which was so cool. Authors are like rock stars, especially ones I love. The Healer's Legacy is that kind of epic, heroic fantasy that keeps me reading instead of sleeping. It features an intrepid heroine named Kira who's escaping from her abusive mate while on a quest to discover her mother's people. Yes, it's a theme done to death, but a good writer can still make it exciting and fill the world with characters one cares about. I liked Kira, because while she's strong, she also has moments of self-doubt and fear. She's afraid but also resolute. Her journey is long and dangerous, though she does not venture alone. Kira has a mysterious gift of rapport with animals, and her traveling companions are a moon cat named Kelmir and a mini-wyvern named Vaith (who totally reminds me of the fire-lizards of Pern, not a bad thing since I love those books). Yes, there is a romance, but it's not the raison d'etre and though Kira's heart is torn, she knows she cannot rest until she finds what she seeks. I actually enjoyed the gentle sweetness of the relationship because Milos, the Holder whose settlement she is staying until sailing season, accepts Kira for who she is. He's also a man with scars on his soul, a man who feels unsuited to the task of his rank, but who is also making changes the more hidebound members of his family do not like. I also liked the shy Milvari, his niece. She's that young girl character who doesn't fit the role expected of her (much like her uncle) and is browbeaten at nearly every opportunity by her mother Mayet. And Mayet is a piece of work, but I had to feel a bit sorry for her at times. The warlord Toril who freed the lands from invaders swept young Kira off her feet and away from the healer who raised her. The problem is that Toril proved to be abusive and Kira escapes as soon as she has the opportunity. She's aided on her journey by her faithful horse Trad, a big cat named Kelmir, and a wyvern named Vraith. On their journey Kira uses her healing skills to win allies. Her ability to communicate telepathically with her animal companions allows her to secure a position as a hunt The warlord Toril who freed the lands from invaders swept young Kira off her feet and away from the healer who raised her. The problem is that Toril proved to be abusive and Kira escapes as soon as she has the opportunity. She's aided on her journey by her faithful horse Trad, a big cat named Kelmir, and a wyvern named Vraith. On their journey Kira uses her healing skills to win allies. Her ability to communicate telepathically with her animal companions allows her to secure a position as a hunter at Tem Hold, where she hopes she can remain through the winter until she can find passage across the ocean. As she wins friends and at least one enemy at Tem Hold, Toril continues hunting for the woman that dared to spurn him. Clearly defined characters, well crafted locations, and natural sounding dialog come together in this novel. The magic and magical people are logical and consistent in the appeal and design and their interaction with the non-magical in their world doesn’t require any but the most minor of adjustment to a reader’s own belief systems. Kira only wants to live a free live and love a good man, but her brutal and cruel mate won’t let her. Her decision to join this man can only be made right by her deci Clearly defined characters, well crafted locations, and natural sounding dialog come together in this novel. The magic and magical people are logical and consistent in the appeal and design and their interaction with the non-magical in their world doesn’t require any but the most minor of adjustment to a reader’s own belief systems. Kira only wants to live a free live and love a good man, but her brutal and cruel mate won’t let her. Her decision to join this man can only be made right by her decision to run from him and his army of mercenary warriors. Running is isn’t easy when she is tracked by professional hunters. Even the help she finds along the way may not be enough. Sharon Skinner is a skilled storyteller. In a quick, easy to read style she gives us a tale that is good for anyone from young adults to those not so young. Fast paced and racing from scene to scene she tells the tale of her young heroine without devolving into pages of pretty, but useless description and world building. This is an author worth reading. I got this book free through Goodreads First Reads. I used to reads this genre many years ago but strayed away from it for one reason or another. I'm slowly coming back. This is the 2nd book I'd picked to read and it was an excellent choice. I easily lost myself in the book. My surroundings fading into the background while I became totally engrossed with Kira's world. Sharon Skinner's writing is magical. Her words sliding swiftly across my eyes causing me to read chapter after chapter when I'd on I got this book free through Goodreads First Reads. First and foremost, I won my copy of this book in a goodreads giveaway. So thank you to whoever was responsible for posting the giveaway, and then to whoever was responsible for shipping it to me. I greatly appreciate it. Secondly, thank you to the author who signed the book. Some people might take for granted a signing, but I do not, and I am honored to have a book that was inscribed by the author. Now, for the review. It was not my favorite book by a long shot, and I find more commonly in the b First and foremost, I won my copy of this book in a goodreads giveaway. So thank you to whoever was responsible for posting the giveaway, and then to whoever was responsible for shipping it to me. I greatly appreciate it. Secondly, thank you to the author who signed the book. Some people might take for granted a signing, but I do not, and I am honored to have a book that was inscribed by the author. Now, for the review. It was not my favorite book by a long shot, and I find more commonly in the books I win on goodreads, and have read recently, the whole plot is about a character making a journey to fulfill some sort of goal they have in life. I know this the "The Hero's Journey" and is coveted among authors and readers alike, but the way it is presented makes the biggest difference possible. The way it was laid out in this book, was more about the journey and the steps the time that was spent in passing, waiting for one end of the spectrum to the other. There was a heavy reliance on the past, which was explained in vagueness, without giving away too many details here and there. The ending came swiftly, with a resolution that was the matter of pages in length. Of course, any cover of times is the matter of pages, but the resolution to this novel was so rushed, it seemed almost unnecessary. The whole of the book was about the time spent in Tem Hold. There was a brief fight and flight in the beginning. A little stop with the gnomes to tie in allies for the battle at the end, but overall, it was focused on Kira's stay at the hold. To that much, the time was basically frittered away with Kira hunting in the woods and keeping secrets from the people who housed her. Sure, Kira taught some kids, and did some hunting, and took Milos to bed, but overall, her deceit, and her hidden bond to the animals was what the focus of the book was on. There wasn't even a huge back story. All the ideas through Kira's mind could be bulleted easily through the entire novel. Being; "Toril is going to get me. My mother might have hidden secrets form me. I can't tell anyone about my connection to Kel and Vaith because they wouldn't understand. I can't tell anyone who I am because I'll bring problems. I'm scared of Toril. I'm scared of men. I'm scared of being found out and found period." With the mass of repetition, there wasn't much to be surprised about. Then, there was a smattering of difference, when chapters in different perspective were tossed in, but really? They were all predictable. Milvari likes herbs. Mayet is a selfish, jealous harlot who thinks only of sleeping/marrying her way into power. So, both of their views on manners got dull and boring, contributing to an ending that was predictable form the start. Kira was going to get caught. There was going to be a standoff. Someone was going to lose, and undoubtedly, it had to be Toril because Kira is the heroine and she had to prevail. Even her romance with Milos was predictable. The outcome was either, she'd leave and they'd part, or he would follow. And look what happened? Milos followed. Clever and fast paced with many creative character and ideas. It was easy to hate the bad guys and cheer for the good guys as Kira finds her way fleeing from an awful past. Sharon Skinner delivers an engaging tale filled with layered stories that keeps your interest until the end. I am eagerly awaiting the sequel! This book was Really Good! I enjoyed reading it. I won't spoil it you have to read it. This was such a great story with wonderful rich characters. I stayed up well into the night unable to put the book down. I liked the slow build to the romance. It's a high fantasy, swords and sorcery, magical beasts and inhuman races; but like all good fantasy, the setting and the world is only that: the setting. The story is about Kira. And sure, Kira has a psychic connection with a moon cat (Essentially a black panther) and a wyvern (a tiny dragon), and she has training in herbalism and the healing arts; but the main thing is that she is an orphan who was taken in by a healer who made her an apprentice, and when Kira reached her adolescence, she quit It's a high fantasy, swords and sorcery, magical beasts and inhuman races; but like all good fantasy, the setting and the world is only that: the setting. The story is about Kira. And sure, Kira has a psychic connection with a moon cat (Essentially a black panther) and a wyvern (a tiny dragon), and she has training in herbalism and the healing arts; but the main thing is that she is an orphan who was taken in by a healer who made her an apprentice, and when Kira reached her adolescence, she quite naturally rebelled, and ran away from home after an argument; she then met a man. A strong, handsome, dashing man, who swept the young woman off of her feet and made her a princess – because this man is the Warlord, the leader of a mercenary company that fought off an invasion and saved all of the people of the countryside. But this man is also abusive, violent, unstable, and obsessed with Kira. And that, more than anything else, is the story of this book. Kira manages to escape in the beginning chapters, and then she nearly kills herself throwing off pursuit, because the warlord's men do not give up, as they know their master will not give up. But Kira does manage to give them the slip, and then, for a while, she finds peace, and what may be a new home – maybe even a new family. Until the Warlord finds her again. Then she has to decide whether she will run away, or try to stand and fight: the second option is her only hope for a lasting freedom from her abuser, but it is immeasurably more dangerous for her and for the people she's grown to care about. And of course I won't spoil which option she chooses. I will add that there is an additional reason for Kira to be traveling: she isn't just running away from something terrible, she is also running towards something – the hope that she can find out something about her mother's people, which is where she got her red hair and green eyes, and might be where she got her psychic ability, as well. And the place where she stays, and where she might decide to make a stand, is not filled only with welcoming kind-hearted folk; she has enemies there, enemies that might even be more dangerous to her than is the warlord himself. The characters are wonderful: deep and complex, well-realized and genuine despite being characters in a fantasy novel. There are all the elements of a good story here, and that story dominates, complemented by the fantasy world and the political intrigues and the rest of it. The fantasy world is also good, with an interesting depiction of feudalism and a good use of Kira's healer training, one which made both the character and the world more relatable and realistic. Enjoyable first novel. I met Sharon Skinner when she was Writer in Residence at my local library and couldn't resist buying her book based on her brief description, which highlighted the young heroine on the run from a powerful army accompanied by a wildcat and a tiny dragon. I loved a lot of things about this, including Kira's connection with her mentor Heresta and the way Kira passes on the healing lore later on, the animals, Kira's good heart and bravery, and a lot of the side characters. The Enjoyable first novel. I met Sharon Skinner when she was Writer in Residence at my local library and couldn't resist buying her book based on her brief description, which highlighted the young heroine on the run from a powerful army accompanied by a wildcat and a tiny dragon. I loved a lot of things about this, including Kira's connection with her mentor Heresta and the way Kira passes on the healing lore later on, the animals, Kira's good heart and bravery, and a lot of the side characters. The world, complete with friendly gnomes and scary rock trolls, felt real. There were plenty of long sections when I was so drawn into the story that the real world dropped away, and I had that "lost in a good book" feeling I'm always hoping to find. I kept trying to tell my cat about all my feelings for this book--giving her my plot guesses and 'oh no!' moments--but I'm not too sure she understood me as well as Kel and Kira understand one another. I absolutely enjoyed the setting for this, and cannot wait to learn about what lies beyond the sea! I really enjoyed the collection of characters that we got to interact with, and especially see them grow and define themselves against one another. It has a slow start, but once the author starts switching from different characters points of view it is a lot easier to get wrapped up in the story. I really enjoyed the idea of the main characters abilities. Kira's animal companions are some of my favorite characters. Overall I am glad I have the next book when I want to pick up Kira's story again. I thought this fantasy story is astonishing! Coming from someone who has read plenty of fantasy/fiction books, this book is right up there with the Game of Thrones series. Sharon Skinner’s creation is captivating and keeps you spellbound. Sharon Skinner is an amazing woman I met at a Science Fiction convention in Tucson quite by accident. I'd never heard of her before, but over half of the panels I attended had her as a panelist, and since the convention was quite small, we recognized each other's faces after only a day. I found out that Sharon, like me, has a full time job other than writing, and yet she managed to balance the two and achieve her dream of being a published author. She inspired me, frankly, and therefore I made i Sharon Skinner is an amazing woman I met at a Science Fiction convention in Tucson quite by accident. I'd never heard of her before, but over half of the panels I attended had her as a panelist, and since the convention was quite small, we recognized each other's faces after only a day. I found out that Sharon, like me, has a full time job other than writing, and yet she managed to balance the two and achieve her dream of being a published author. She inspired me, frankly, and therefore I made it a point to acquire one of her books. That book is The Healer's Legacy, the story of a healer's apprentice, Kira, a young woman on the run from an abusive relationship with a warlord famous for liberating their people, but who turned out to be someone other than what she thought. She uses her wits to escape at an opportune moment, and utilizes every trick she knows to stay hidden. Kira, however, is not just resourceful - she has a secret gift, one only her mentor knew: she communicates psychically with animals. Since before she ran away with the warlord Toril, she had two companions, a large hunting cat named Kelmir, and a wyvern called Vaith, both devoted to her and each other. As she attempts yet again to escape, the two come to her aid and help her navigate over long stretches of terrain toward the sea, hoping against hope to reach her mother's people on the other side and finally be out of Toril's reach. However, en route to the coast, she and her companions are attacked by a troll, wounding her mount and forcing her to seek shelter at a hold on the other side of a treacherous mountain pass. She conceals her identity and seeks work as a hunter in order to earn her keep and supplies needed to tend her horse. Alas, the hold is not as peaceful as its exterior makes it appear, and someone on the inside intends to rid themselves of this troublesome newcomer. I love the story's premise - a battered young woman gathers the courage to escape her oppressor. Skinner tries to handle the kind of emotional and psychological scarring that sort of treatment leaves on a person, though considering her target audience, she doesn't go into it as much as she could have. I also love that she communicates with a small DRAGON and a PANTHER. Okay, she calls them a wyvern and moon cat, respectively, but still. I also love specific characters in this book, most notably Ryospar, a gnome, Brilissa, the cook, and Milvari. Brilissa is the no-nonsense character with a soft heart, and Milvari is the holder's shy, socially awkward niece constantly berated by her mother, but gains confidence and knowledge from Kira. Milvari reminds me of me, when I was younger, though I was bullied by other kids, not my family, which made me stumble over my words and want to hide behind my hair and only come out to feed the horses. Ryospar doesn't seem to be of much importance at first glance, but then he just charges in toward the end of the book in a spectacularly heart-warming way that nearly made me cry. There are a few things that detracted from my experience with the story, the biggest one being pacing in some areas, eg. the jump from Mayet (aforementioned belittling mother) returning from her cousin's wedding all geared up for a confrontation with the holder, Milos, to suddenly being distraught that... wait, that would be a spoiler. It was one of those moments where I went, "What, who? How did that happen? WHEN did that happen?" It disrupted my suspension of disbelief. This sort of thing happened a few times, but not often enough to frustrate me. I also felt that in some places Skinner could have expounded more, used different words, utilized more complicated sentences... action verbs... stuff like that, but that all points to my personal writing style and not anything wrong with the book itself. This review has been hidden because it contains spoilers. To view it, click here. The book was a mixed bag for me. On one hand, the idea story was compelling - a young woman who had just escaped an abusive relationship and was trying to find herself by finding her origins, while fleeing the grasp of her warlord husband. On the other hand, there were bits that I didn't care for. Sometimes the writing would focus a bit too much on a detail, to the point where I would skim down to the next paragraph and not miss a thing story wise, and then wouldn't focus on people or concepts t The book was a mixed bag for me. On one hand, the idea story was compelling - a young woman who had just escaped an abusive relationship and was trying to find herself by finding her origins, while fleeing the grasp of her warlord husband. On the other hand, there were bits that I didn't care for. Sometimes the writing would focus a bit too much on a detail, to the point where I would skim down to the next paragraph and not miss a thing story wise, and then wouldn't focus on people or concepts that I felt needed more exploration. The main character felt distant to me most of the time, like she wasn't just guarding herself from the world, not knowing who to trust, but she was guarding herself from the readers. Which is a pretty neat feat to pull off in writing, but I was not invested in the character as much as I could have been. And, lastly, the story didn't even address one - if not, the main one - of its establishing questions: Where did she come from? She was on a journey to find the distant land where her parents came from and only at the very end of it does she finally get on her away again. But there was enough good in this story to keep me reading. Her animal companions had personalities of their own but were not gimmicks nor gifted with human intelligence. Her panther was a panther, and her dragon was a dragon. Just because she could understand them and they could understand her did not change them. Although the book was mostly human-based, she did bring mythical races. The Hold she ended up at had a lot of great characters in it, both good and bad. The world Skinner built was really well done, as well. And the ending battle was engaging. 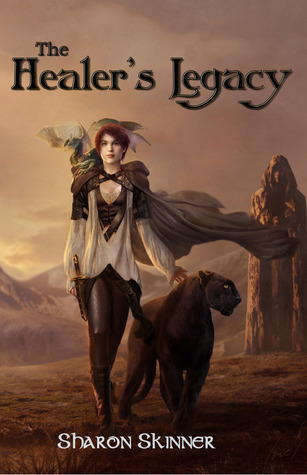 THE HEALER'S LEGACY is a captivating fantasy novel. Kira, the main character, is very likable because she is believable. I saw her as a very principled, and very troubled, individual. How could she not be, with the Warlord Toril essentially chasing her to the very ends of the continent. Her companions are a wyvern and a moon cat, whom she is able to communicate with telepathically. When the story opens, she manages to escape from Toril's guards. She then crosses the continent, helping to heal a THE HEALER'S LEGACY is a captivating fantasy novel. Kira, the main character, is very likable because she is believable. I saw her as a very principled, and very troubled, individual. How could she not be, with the Warlord Toril essentially chasing her to the very ends of the continent. Her companions are a wyvern and a moon cat, whom she is able to communicate with telepathically. When the story opens, she manages to escape from Toril's guards. She then crosses the continent, helping to heal a gnome child along the way (a very important event later), fights for her life with a rock troll in a vicious storm and ends up at Tem Hold. What happens then? Read the book and find out! I will say that the ending was most satisfactory and definitely left the door open to a sequel. What a great novel! Sharon does an excellent job of bringing the characters to life and drawing you into the book with characters that are believable and that you actually care about. The writing is beautiful in is simplicity but vividly describes the world around you so you can actually picture and feel what is happening rather than just being told a story. Great resolution and ending with just enough foreshadowing for the next book. Looking forward to the next book in the series. I enjoyed this book very much, uneven as it is. This first novel demonstrates a writer with promise. The antagonists need to be more developed, and the ending is ambiguous. I don't begrudge the time it took to read it, though, and will buy her next book. This is the first book by Sharon Skinner I have read and I thoroughly enjoyed it and highly recommned it. Great read. This book is a great read. the relationship between the companions is perfect. Kira's adventures are just starting. can't wait for a sequel. great work Sharon!!! Superficial and filled with errors. Would have abandoned if it hadn't been such a fast read. Really enjoyed this book. I am patiently waiting for sequel. I picked up this book at my local comic-con. Wanted something new and different to read. First time reading a fantasy book, I absolutely enjoyed this book. Cannot wait to read the second book.